Since time immemorial people have cried out - 'what we really need is a 23,000 seat multi purpose arena somewhere near Woolwich'. Of course this dream was finally attained last year with the reopening of the Millennium Dome O2 - back in the day, however, the plan was to install this pivotal piece of infrastructure in the heart of Canning Town and use its honeypot-like draw to redevelop the derelict Royal Docks. Where now stands the ExCeL Centre (Alight here for Boxing, Fencing, Judo, Table Tennis, Taekwondo, Weightlifting, Wrestling, Boccia, Paralympic Table Tennis, Paralympic Powerlifting and Wheelchair Basketball) and its adjacent wasteland was to be a palace of sport and the arts known as The Londondome (being the eighties conjoined words were in and random capitalisation of mid-word letters was out). 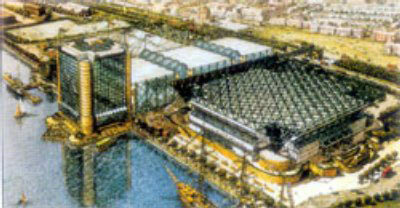 The Londondome was to comprise a multipurpose arena suitable for hosting Gladiators, Torville and Dean performances and other attractions of the age with an adjacent 20,000 square metre conference centre (Wish You Were Here Live, perhaps?) and a 500 room hotel. The scheme was topped off with nearly 2,000 homes, a 'Covent Garden style town square' (the 80s equivalent of the now de rigeur 'continental style plaza'), one quarter of a million square metres of office space and windswept parking for 13,000 Ford Scorpios and Renault Espaces. Two and a half million people were expected to head out to this 75 million pound jewel, but nowhere felt the chill of the 1991-92 downturn like Docklands. This and the two other consortia schemes set up by the London Docklands Development Corporation to develop the Royals disappeared, leaving nothing but a few press releases and optimistic brochures as evidence of the grandeur of their ambition. It's worth wandering down the edge of the Royal Docks today; despite the millions of pounds that have been poured into this patch of Newham and evident signs of progress in parts, this is still - nearly 30 years later - unfinished business. Had 1991 turned out differently, perhaps E17 would have played to sell out crowds in E16, and, come the 30th Olympiad, a maturing Londondome would be enjoying a fresh coat of paint and preparing to host the table tennis. Check out previous recession blogging using the Recessionist tag.